Our medals are finished in this dedicated workshop: bronze, antique silver, white silver, mat or part-shining gold, each tone requires a different treatment. First, the medals undergo a sandblasting process. Then they are set up on a metal frame and placed in various electrolyte baths according to the expected tone. Thanks to our expertise and our precision in the stabilization and adaptation of the baths to meet the expectations of each of our creations, we are able to offer products with high quality finishing. In order to create a bronze patina or an antique silver tone, medals are oxidized at the end of the surface treatment. They are then sanded to remove all the oxidization excess and to keep only the parts necessary to highlight the reliefs. 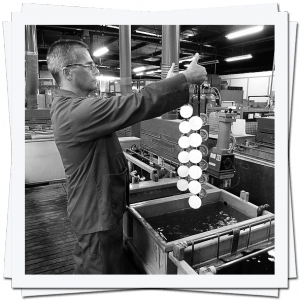 It is a delicate hand-made operation performed on each medal individually, so homogeneous, luminous and subtly contrasted medals can only be achieved through our know-how.